While I don’t specialize in coins from Guernsey, I do specialize in overdates. So when I spotted a Guernsey 1 Double that is widely attributed as “1868/30”, I decided to do a careful analysis. 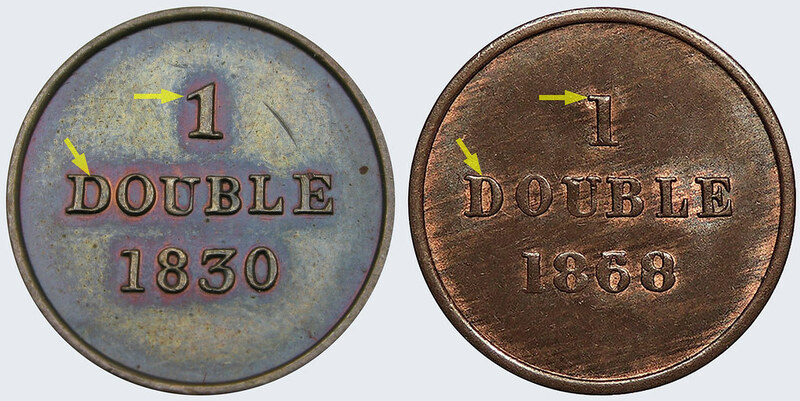 The Guernsey 1 Double coin was first struck in 1830, next followed by 1868--both at the London Royal Mint. While I understand the apparent logic behind the “1868/30”, I’m skeptical of this attribution. Firstly, a date spread of 38 years is uncommon for overdates. Obviously, it requires the mint to store a die for many years without rust damage, and then fit the older die to a press which may have easily changed over those 38 years. Secondly, the Royal Mint changed planchet compositions in 1860 from copper to bronze. Striking coins with a harder metal like bronze on faster presses than used in 1830, requires tougher dies. And no doubt, die steel alloys improved over this time to accommodate the greater pressures needed for bronze coins. So an 1830 die on a press in 1868 may have not worked very well. 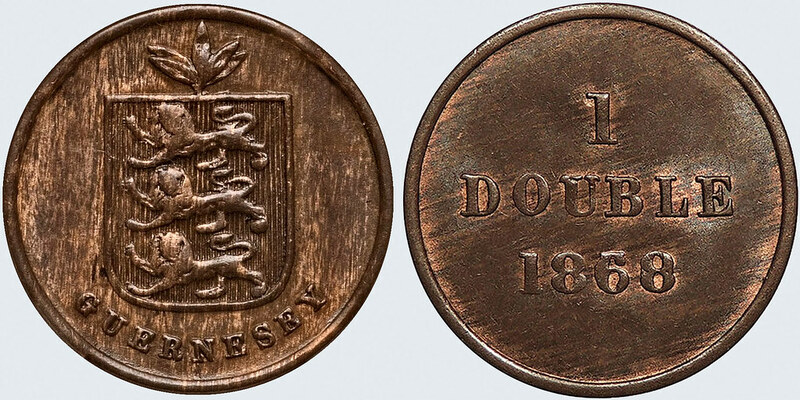 The obverse and reverse of the 1868 Double—a small, simple coin worth 1/80 of a French Franc. While this coin was struck in London, French coins were also used in Guernsey at this time. 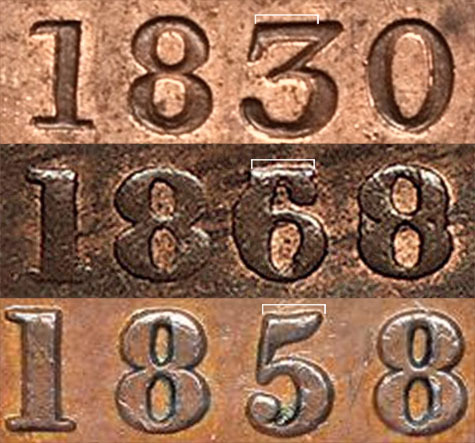 Below--a detail of the date, showing the “1868/30”, with corners of a digit clearly protruding from the top of the 6. 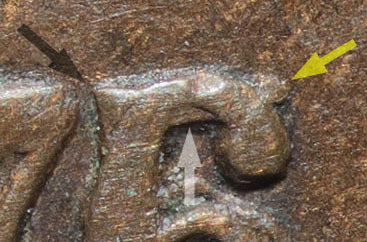 Even at this magnification, it can be seen that the mark on the 6 is blunter on the left, coming to a sharper point at the right. This is an important detail which I will discuss below. To discuss the plausibility of an 1868/30, I now compare the date on the 1868 to the 1830, scaled equally. The white bracket shows the width of the mark in question, compared to the top stroke of the 3 from 1830. Given the size and shape differences on the 3, I don’t think a 6/3 adequately explains what I see. However, by comparing the mark to the top of a 5 taken from an 1858 Guernsey coin, I see a significantly closer match. Notice how the shape of the top of the 5 more closely resembles the mark under the 6—ie blunt on the left and coming to a sharper point on the right? Based on that evidence, I’m more persuaded of a 6/5 in this case. Indeed, markers like this are seen on 6/5 overdates of this period—such as this coin from Sweden--second picture. Finally, there are stark differences in the style of "1 Double" on the 1868 die which clearly show it's not a re-dated 1830. The lettering on this 1868 matches other 1868 reverse dies. While the 1 Double was not struck in the 1850s, I suspect this particular overdate shows either a proposed die run during that time, or possibly just a misdated die from 1868 that was fixed and used. I would suspect 1868/5X, with the last digit a 0 or perhaps an 8 that was shifted up. A date spread of 10-18 years is more plausible too. Excellent discussion Thulium. Thank you. I am quite convinced that you are right on the third digit being a five, because - as you show - the font used on the die is the type of 1868, not the type of 1830. I find the argument of "die would not fit press" less convincing. On one visit of the Utrecht mint I was shown a 150 years old press that was in use during my visit - to strike proofs. Minters are government officials. They don't discard stuff just because it's old or even just because it will never be used again. Why else can you find so many unused dies? Why else could a collector friend assemble a whole collection of old minting tools and equipment? For the same reason, it would make perfect sense to use an old die even on a harder metal. Sure, it will wear quicker, but it will still strike coins for a while. That leaves the fourth digit to fret about. I note a small blob sticking out on the right I don't see on the left. For that reason, I would prefer a non-symmatrical numeral. How does a 4 strike you? Thanks Peter for adding to the discussing and giving me something to think about. My thoughts about the presses 1830-68 were a pure guess, and quite probably wrong. I have also observed that mints keep everything in use for as long as possible, then retire the machinery to their museum. While I'm fairly confident of a 6/5, I'm far less certain of the last digit. It could be a 4, or perhaps a digit with more curves. When I get a more detailed specimen to analyze, I will revisit this topic. Here's mine for comparison, if it helps Thulium? Here are my examples. No overdate though. Thanks, Bagerap. With those pictures, I realise that the pointy blob in the "waist" and to the right of the eight of Thulium's coin is not pointy, but rounded and looking pointy because of a shadow effect. That changes the outlook from a non-symmetrical to a symmetrical number, bulging in the middle on both sides. My best guess would now change to a zero. The 1830 issues were struck by Boulton, Watt & Co (Birmingham) whilst the 1868 issues by Partridge & Co (Birmingham) - so two different mints. In addition there are two types of 1868 issues - with and without the spray on the stalk - I'm unsure if this means there are additional variances in the lettering. Nice picture with good detail! That looks very similar to 6/5 markers that I have on other overdate coins. That roughness on the lower left edge of the 6 is probably due to remnants of the lower ball of the 5. I'm still undecided on the last digit. It could be 8/0, but obviously this coin was not struck in 1850 either. So I suspect a die was mis-dated and fixed. Thanks everyone for your comments. I think from what I've seen I'd favour the last digit being a 0. Perhaps an 1850 mintage was planned, but cancelled?